This is the declaration made by Mr Eric Koller, the President of Madagascar Tourism and Minister Alain St.Ange, the Seychelles Minister responsible for Tourism and Culture. Mr Koller and Minister St.Ange met on the sidelines on the International Tourism Fair of Madagascar held last weekend in Antananarivo. Both Madagascar and the Seychelles are active Member States in the Indian Ocean Vanilla Islands Regional Organisation, and both want to see the consolidation of the tourism industry in the region. Air Madagascar is currently finalising its plans to launch flights to the Seychelles, and this opens the door for the Tourism representatives of the two islands to develop twin centre packages with Madagascar, the big island of the Indian Ocean and the Seychelles. Madagascar has been welcomed back into the Community of Nations since its last elections that saw a new democratically elected President come to power. Madagascar now says that they are ready and willing to work with reliable partners who believe in the spirit of togetherness for a better future. Mr Eric Koller was personally in Seychelles in April when he led the Madagascar delegation to the 2014 edition of the Seychelles Carnaval International de Victoria, which they also jointly co-hosted alongside Seychelles, La Reunion, Mayotte and South Africa KwaZulu Natal. 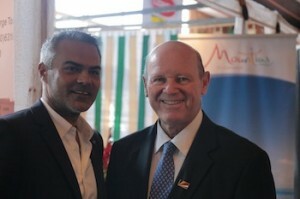 Minister Alain St.Ange who was in Madagascar leading the Seychelles delegation to the International Tourism Fair of Madagascar said that it was important for Member States of the Indian Ocean Vanilla Islands Organisation to come together for events that appear on the Organisation’s Calendar of Events because this remains the best way to raise the visibility of the islands by working together in showcasing the diversity of the culture of the Indian Ocean Region.